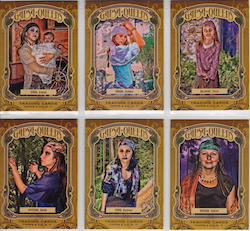 Gypsy Cards are a packs of card which can vary in size anything from 16 to 52 instead of having 78 cards as in a tarot deck. Therefore they are very random in how big is the deck and which card are in them. In 1940, Whiteman Publishers produced the Old Gypsy Fortune Telling Cards, a deck a 36 cards. One of the big different between tarot and gypsy cards is that gypsy cards have no suits. There is however, only suit represented with the King and Queen of Hearts. This deck above was my very first Gypsy card deck and it came with a hand cover book. In the past Gypsy families use to paint their own hand painted cards most likely with water colour paints or coloured pencils and each family had their own style or even different amount of cards to each deck. My smallest deck is 16 cards only which came from Germany. No book available with this. My largest the Paintly Deck from a supplier in Sydney Australia this deck has 52 cards in it and it did come with a booklet with the meanings of each card.